Does your heart unexpectedly start to race or pound, or feel like it keeps skipping beats? These sensations are called heart palpitations. 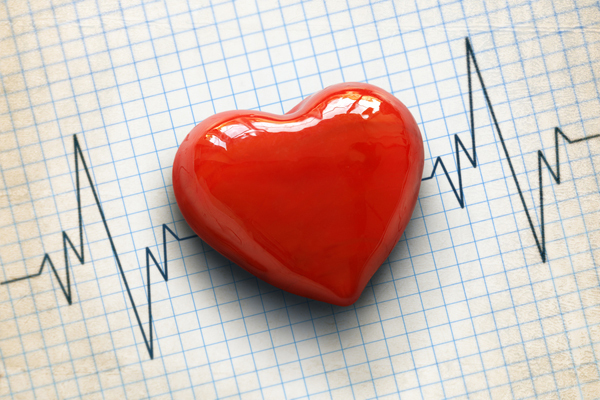 For most people, heart palpitations are a once-in-a-blue-moon occurrence. Others have dozens of these heart flutters a day, sometimes so strong that they feel like a heart attack. Most palpitations are caused by a harmless hiccup in the heart's rhythm. A few reflect a problem in the heart or elsewhere in the body. Different people experience heart palpitation symptoms in different ways. Palpitations can feel like the heart is fluttering, throbbing, flip-flopping, murmuring, or pounding. They can also feel like the heart skips a beat. Some people feel palpitations as a pounding in the chest or neck; others feel them as a general sense of unease. People with certain medical conditions, such as heart disease, anemia, and an overactive thyroid gland (hyperthyroidism) are more likely to experience palpitations. Palpitations can be related to drugs and medications such as cocaine, amphetamines, diet pills, some cough and cold remedies, some antibiotics, thyroid hormone, digoxin, or asthma remedies. There are several possible causes of heart palpitations. Trouble from above. Some palpitations stem from premature contractions of the heart's upper chambers (atria). When the atria contract a fraction of a second earlier than they should, they rest an instant longer afterward to get back to their usual rhythm. This feels like a skipped beat and is often followed by a noticeably forceful contraction as the lower chambers (ventricles) clear out the extra blood they accumulated during the pause. These premature beats are almost always benign, meaning they aren't life-threatening or the sign of a heart attack in the making. Two other heart rhythm disturbances that can cause palpitations from above are atrial fibrillation and supraventricular tachycardia. Atrial fibrillation is an irregular and often rapid heartbeat caused by chaotic electrical activity in the heart's upper chambers. Supraventricular tachycardia is a faster-than-normal heart rate (tachycardia means fast heart rate) that begins above the heart's lower chambers. Both of these may cause palpitations that may be brief or prolonged. Both should be evaluated by your physician. Trouble from below. Early contractions of the ventricles can also cause palpitations. A solo premature ventricular contraction, or even a couple in a row, isn't usually a problem unless it's accompanied by fainting, shortness of breath, or other symptoms. A long run of premature ventricular contractions one after the other, though, is worrisome. They can degenerate into the deadly cardiac chaos known as ventricular fibrillation. Other sources. Problems with the heart's timekeeper, called the pacemaker or sinus node, can cause palpitations. So can a breakdown in the coordination between the upper and lower chambers. Scar tissue in the heart from a heart attack or other injury and valve problems such as mitral valve prolapse can also lead to palpitations. Palpitations tend to come and go. Unfortunately, they are usually gone by the time you get to the doctor's office. That makes pinning them down a joint effort. When you have heart palpitations, check your pulse. Is your heart's rhythm fast or slow? Regular or irregular? When your heart skips a beat, do you feel lightheaded, dizzy, or out of breath, or do you have chest pain? Are you often doing the same thing when they occur? Do your heart palpitations start and stop suddenly, or fade in and out? A physical exam can reveal telltale signs of palpitations. Your doctor may hear a murmur or other sound when listening to your heart that suggests a problem with one of the heart's valves. Your doctor may also blood tests if he or she suspects a thyroid imbalance, anemia, or low potassium, or other problems that can cause or contribute to palpitations. An electrocardiogram (ECG) is a standard tool for evaluating someone with palpitations. This recording of your heart's electrical activity shows the heart's rhythm and any overt or subtle disturbances, but only over the course of 12 seconds or so. Your doctor may want to record your heart rhythm for longer to identify the cause of the palpitations. If your palpitations come with chest pain, your doctor may want you to have an exercise stress test. If they come with a racing pulse or dizziness, an electrophysiology study using a special probe inserted into the heart may be in order. If you are at risk for a heart rhythm problem, or if palpitations are interfering with your life or mental health, a recording of your heart's rhythm for 24 hours or even longer may capture an electrical "signature" of the problem. Getting visual evidence of this signature can help determine how best to treat your palpitations. A Holter monitor constantly records your heart's rhythm for 24 hours as you go about your daily activities. Small patches called electrodes are stuck onto your chest and attached to a recorder that you carry in a pocket or wear around your neck or waist. During the test, you keep a diary of what you are doing and how you feel, along with the time of day of each entry. When you return the monitor to your doctor, he or she will look at the recording to see if there have been any irregular heart rhythms. Twenty-four hours often isn't long enough to detect palpitations. An event recorder can monitor the heart for days or weeks. There's even an implantable recorder that can invisibly monitor the heart for a year or more. Cut back on alcohol, or stop drinking it altogether. Make sure you eat regularly (low blood sugar can cause heart palpitations). Have your doctor or pharmacist check all of your medications and supplements to make sure none cause palpitations. For example, decongestants that contain pseudoephedrine or phenylephrine can trigger palpitations. Stress and anxiety are two other key triggers of skipped beats. A two-step approach can help here. To keep palpitations away, try meditation, the relaxation response, exercise, yoga, tai chi, or another stress-busting activity. If palpitations do appear, breathing exercises or tensing and relaxing individual muscle groups in your body can help. Deep breathing. Sit quietly and close your eyes. Place one hand on your abdomen. Breathe in slowly and deeply through your nose. Feel your abdomen move outward. Exhale through your nose or mouth, whichever feels more comfortable. Repeat. If your heart is racing unexpectedly, you can try to stop it yourself with one of the following maneuvers. However, if they don't work promptly and the symptoms persist, have someone drive you to the emergency department or call 911. Valsalva maneuver. Pinch your nose closed with the fingers of one hand. Close your mouth. Try to breathe out forcibly through your nose. Cold water. Splash cold water on your face, or immerse your face in a sink or large bowl filled with cold water. The Valsalva maneuver, bearing down, and cold water stimulate the vagus nerve, which helps control the heart rate. Deep breathing helps relax you and ease the stress and anxiety that can come with palpitations. If self-help techniques don't work, and palpitations are still bothersome, you may want to try some medical options. Medications called beta blockers are sometimes used to treat heart palpitations. They slow the heart rate and control the flow of "beat now" signals that regulate the heartbeat. Sometimes a medical procedure called an ablation is needed. It can control palpitations caused by errant electrical signals in the heart. If you have palpitations with shortness of breath, dizziness, chest pain, or fainting, have someone drive you to an emergency department or call your local emergency number right away. These may be signs of a serious heart problem.